As soon as its available to download for developers, i can’t resist to try it on my iPhone. 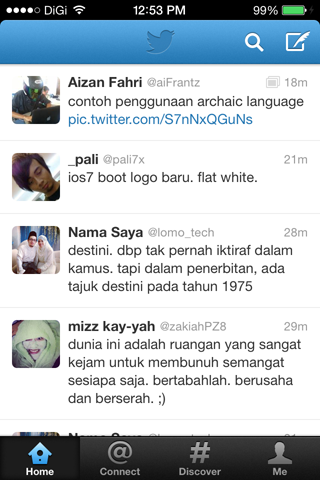 There’s a lot of agreement and disagreement about iOS7. Some love it, some hate it. But one thing for sure, this is the first major overhauling they’ve done since the original iPhone. 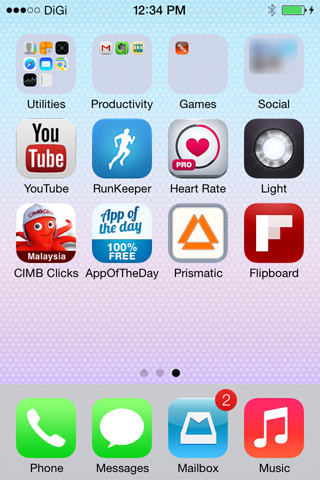 I installed it on iPhone 4, which is the minimum requirement for iOS7. 3GS had its run for good, and i didn’t embrace for iPhone 5 just yet. The installation went smooth, and there’s few changes that you will notice right away such as installation progress bar and boot logo, which is all flat. I’ve been able to restore from previous local backup, but i did reset the settings just in case it would interfere with previous iOS 6 settings. So many changes that i didn’t even know where’s to begin. But since this is just impressions, not a review, let’s browsing through Settings. If you’re using Windows Phone, then you might be aware its quite identical with Light Mode background. I don’t want to go through every details, so i’m going to highlight few features that might be interesting for most users. 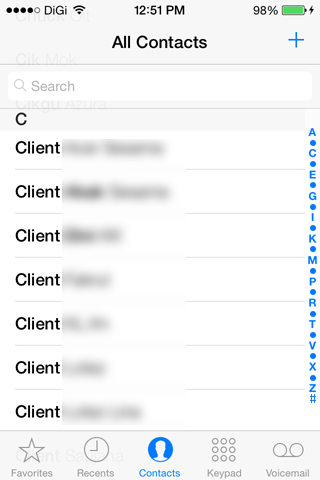 This would render any third-party app for blocking contacts useless. 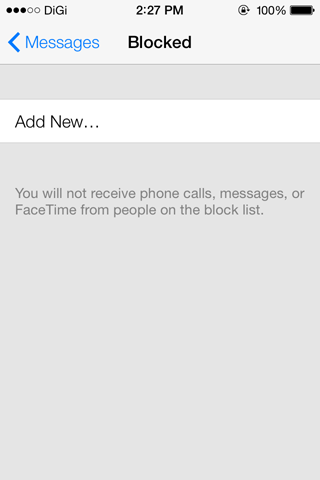 I didn’t really use this feature, but its really useful for those who wants to block old flame that still burning around. 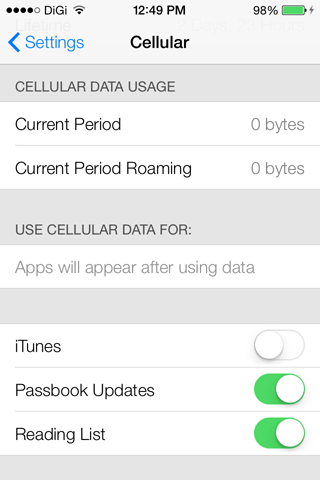 You can view bandwidth, which apps using your data and view call time all in one place with fewer taps now. 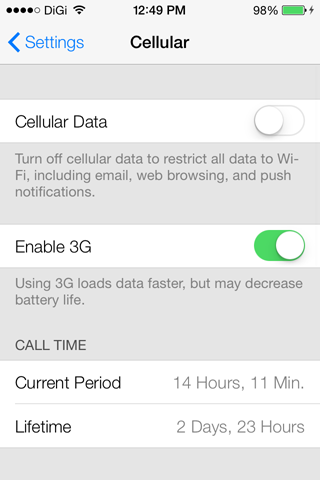 Previously, it was Settings > General > Usage & Cellular Data to do this, now its just Settings > Cellular Data. Neat. 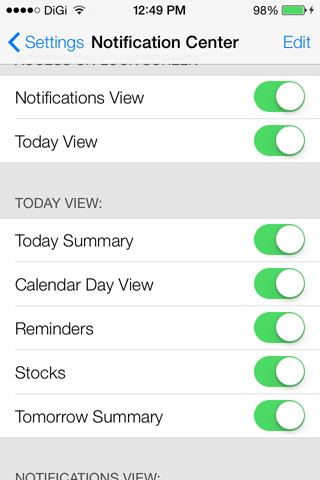 Notification Center’s improved as well. I haven’t really look through it yet, but it would be great if third-party apps divides into their own notification’s classes like productivity or games, just like iOS labelled the folders automatically based on app. 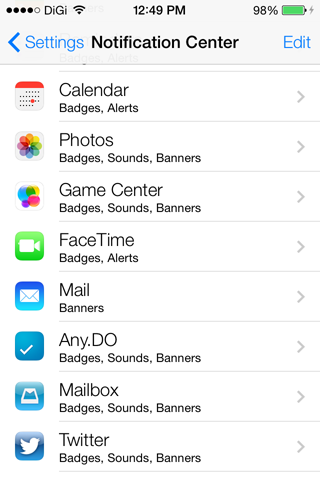 On iOS6, calls and notifications won’t be silenced when you’re using it. 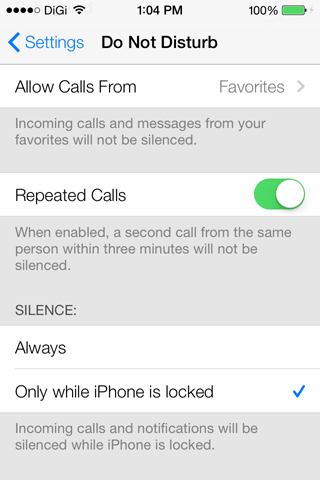 Now, you can have it silence during usage as well. 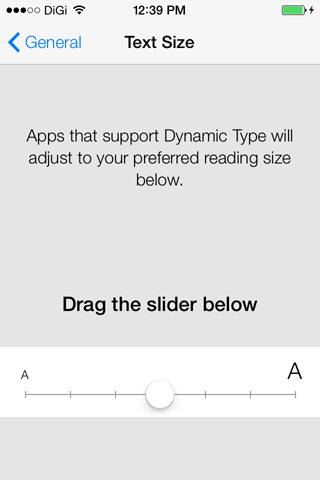 You can even adjust Text Size in fewer taps as well without going through Accessibility. Might come in handy for first time user. 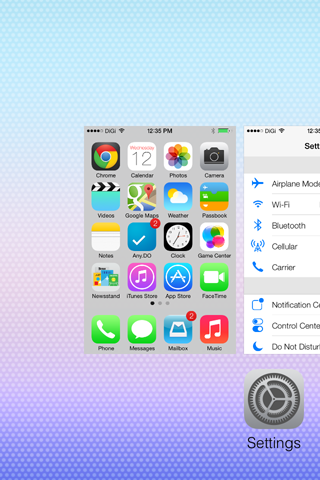 One of most requested features was an easy access to basic settings such as Brightness, Wifi, Bluetooth and Airplane mode. 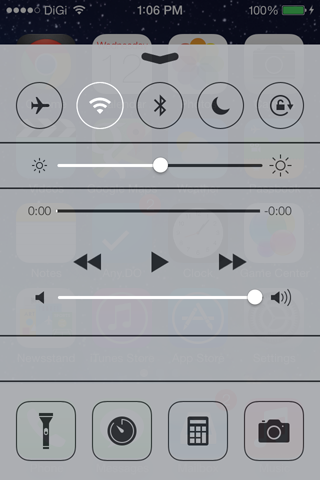 Well, Apple heard you, and now you can swipe up from bottom to reveal Control Center. There’s even torchlight function which already put the torchlight app on my iPhone before to trash. 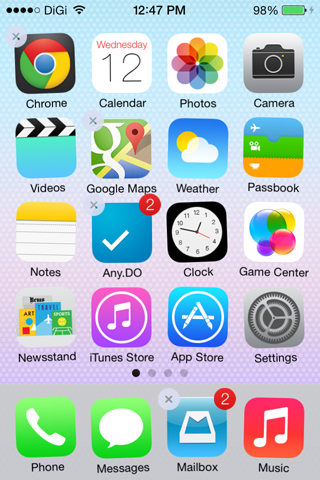 Jailbreakers now can finally say good bye to SBSettings and Mobile Substrate. 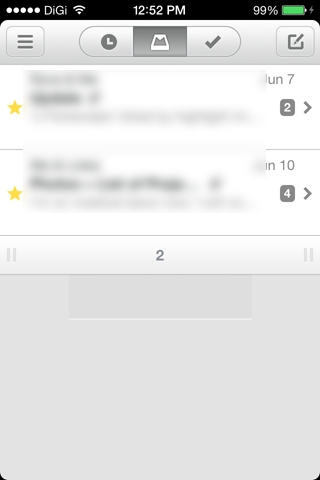 But one of many features that i’d really love is how easy to multitasking now. Its something that finally done right. Double tap the home button as usual to activate it, and instead of tap and hold the app until its jiggles, tap X close, you just swipe it up. Done. 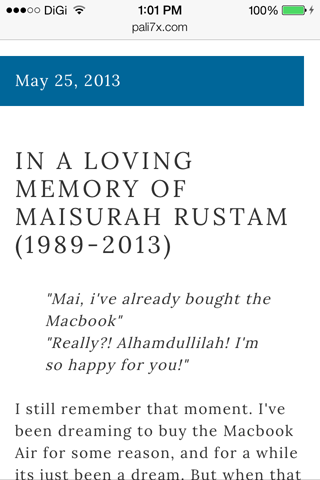 I didn’t use any third-party messaging services like Whatsapp, Line, Wechat or even iMessage. I do socialize, but if people really want to contact me, there’s always more than one way to reach me. Plus it helps me filter out unwanted noise from cluttering my life too much. Message app didn’t get any extra function, but chat bubbles now bounce when you scroll through up and down and gets more playful. Sending indicator gets a flat line, like laser beam. Its kinda more fun to texting now, and i guess if third-party messaging can be integrated into Message rather than as separate apps, like a plug-in, it would be great. 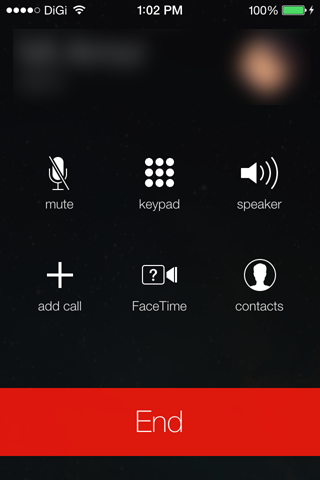 To be honest, i didn’t really like the improvement on call function. I almost confuse it with my mum’s Nexus. I’d hope they’re going to do something with this for official release since this is the primary function of an iPhone. 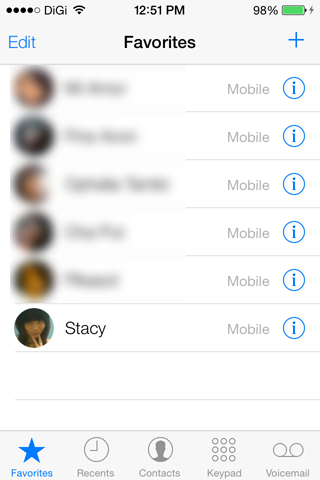 Apart from call, i’d like the improvements in few other areas in Phone function especially Favorites. I’m not gonna show you all of my favorites, but since i can’t blurred it all out without showing the improvements, my friend here, Stacy, would be the victim of unintentionally lacked of privacy. Sorry mak cik. Back to basis. 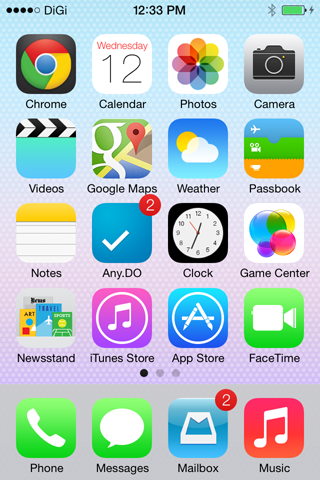 As you might notice, iPhone 4 didn’t support transparent dock and folders like 4S and 5 does. 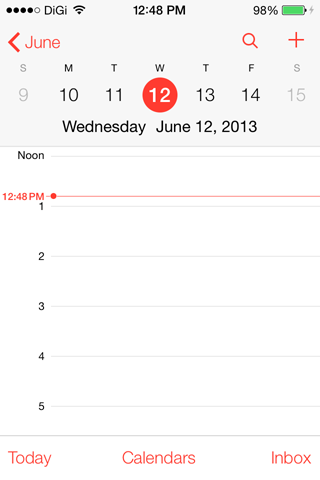 I don’t think its required significant processing power, but you know, iPad 2 didn’t gets Siri as well. Maybe its time for upgrade. But if you can live without few eyes candy, all new features alone already outweigh the liability. Ever since Google pulled off ActiveSync for cheapskate users who didn’t want to apply for Business-plan like me, i switched to Mailbox for good. 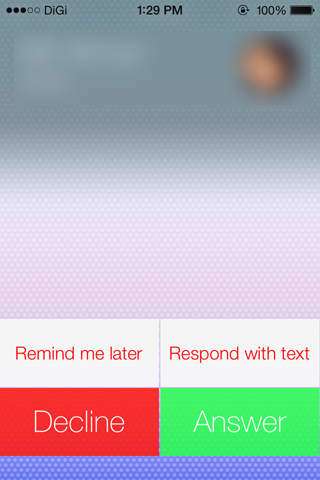 And it’s still working just fine in iOS7. 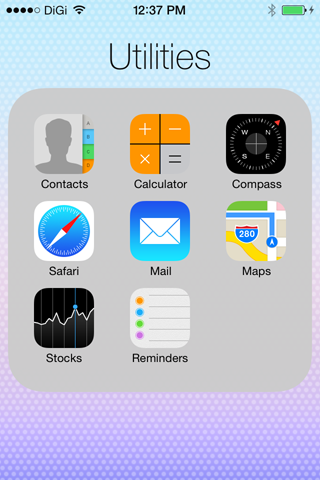 Stock apps like Notes and few others as well, losing its skeumorphism design from 2007. Remember guys, if you’re apply for haircut, tell them hairstylist you’d like flattop. Why? Because its flat and its top. 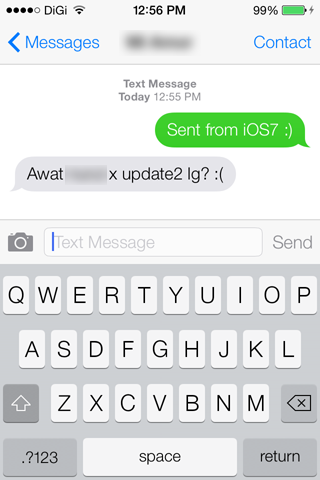 With iOS7, you can no longer tweet or update status right from Notification Center, which mean on Facebook you’d lose cool status than ended via iOS. 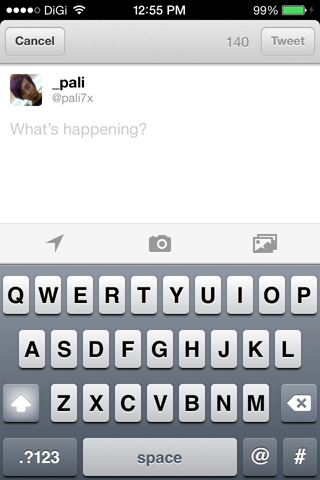 Third-party apps like Twitter and few others as well still showing up old keyboard. 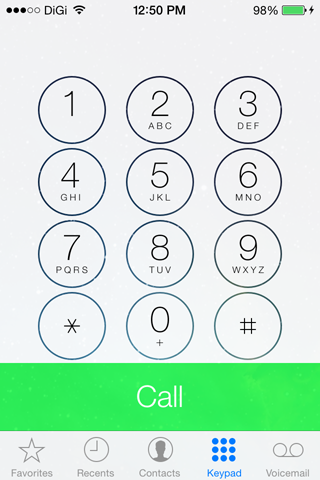 Don’t worry about it, by the time for official release, developers already took advantage of what iOS7 comes to offer. Stay tune. Apart from new interface on Camera function, there’s new features and faster image capture as well. 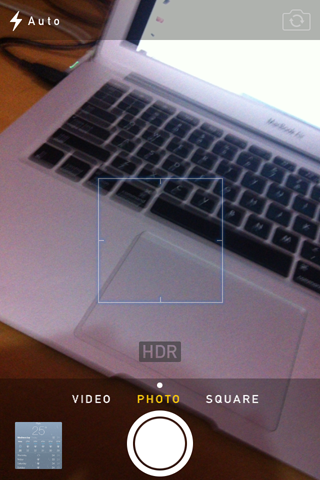 Now you can apply some filters on your photo, switching between Video, Photo or Square mode with just a swipe. Here the catch if you’re using Grid, its missing from Camera app but you can toggle in through Settings > Photos and Camera. But i’m sure not how many people would use it. 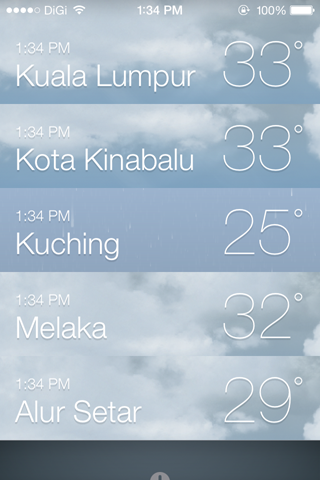 If you’re using iPhone 5, you can apply filters in real-time. 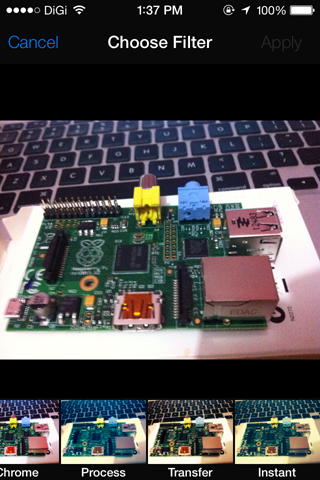 After that, you can easily publish your photo or view it on AirPlay. 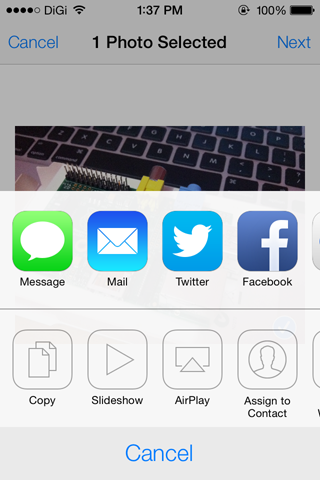 If you’re using supported devices, you can share it via AirDrop. This wasn’t limited to sharing photos only, you can easily transfer files as well through AirDrop. 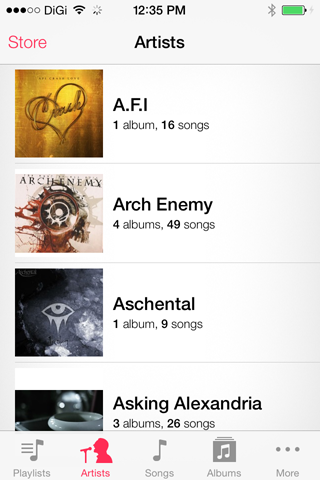 Music app now how its should be. 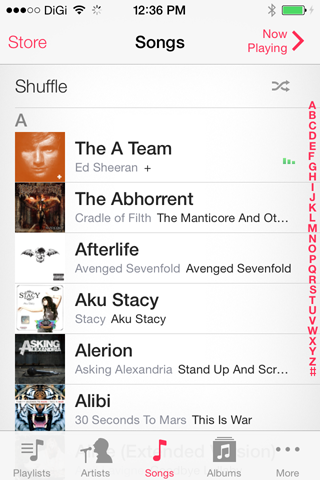 Better browsing with album arts to show off, but unfortunately i didn’t like the font color. I don’t know if its pink or salmon, but i wonder why they didn’t take what they did with iTunes, adjust font colors based on album art. That would be cool. 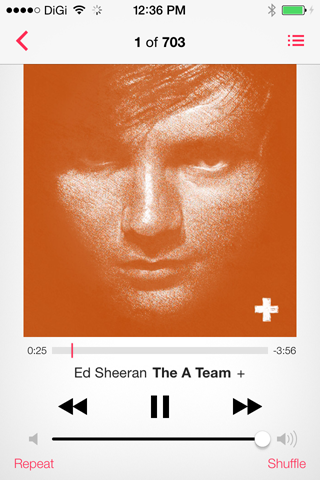 One minor feature on Music app, there’s animated equalizer on song you’re playing while you’d browsing around music. I’ve replaced Safari with Chrome as soon its available, mainly because all my browsing bookmarks and ability to pick up where i left off browsing on Mac through my iPhone. 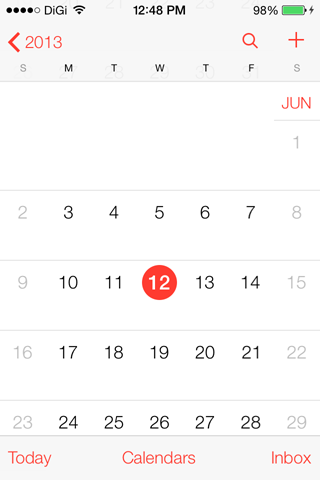 But now, Safari has been redesigned to focus more on contents as long as you scroll through the web. 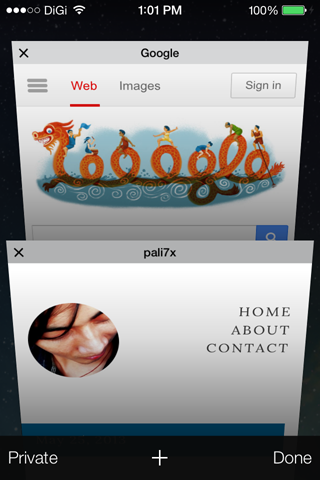 But more importantly, browsing with multiple tabs has never been easier with Safari on iOS7. 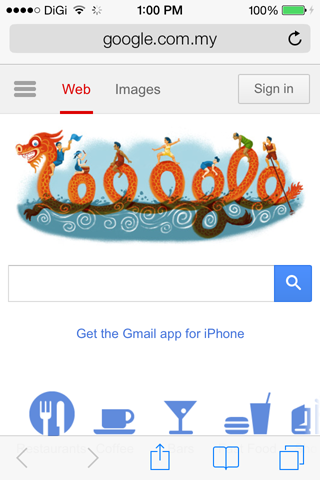 If it wasn’t for my data on Google, i’d definitely end up ditching Chrome for Safari. 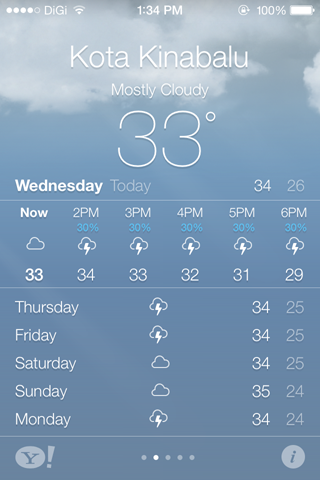 I didn’t use Weather app much. But i’d like what they’ve done this time. 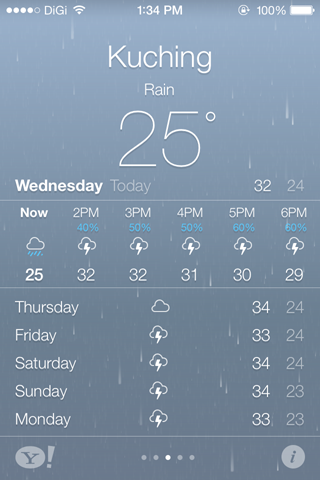 Its beautiful and pretty much render every weather apps in App Store useless. Not to mention, you don’t have to purchase it. I’ve been using it for few hours now and been experiencing few bugs as well. 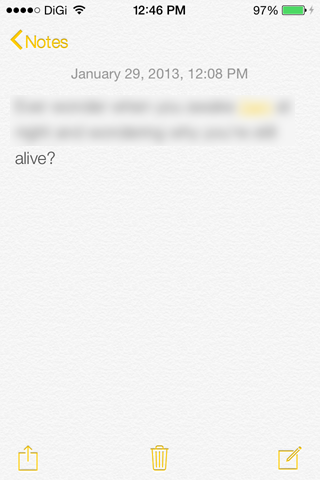 This is normal for beta build, and i’m looking forward to report about battery life performance on iOS7. Keep in mind that this is my personal point-of-view judgements and shouldn’t be used to reflect the official release coming this fall.